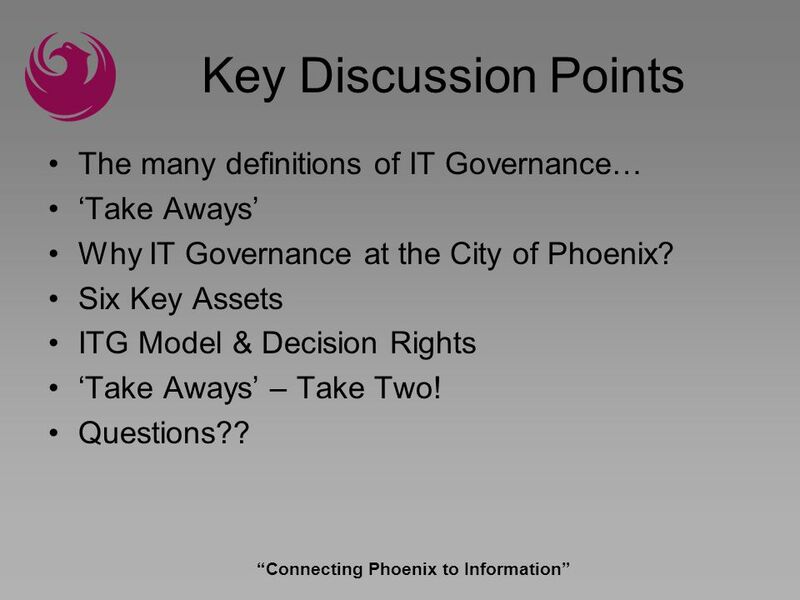 2 Connecting Phoenix to Information Key Discussion Points The many definitions of IT Governance… Take Aways Why IT Governance at the City of Phoenix? 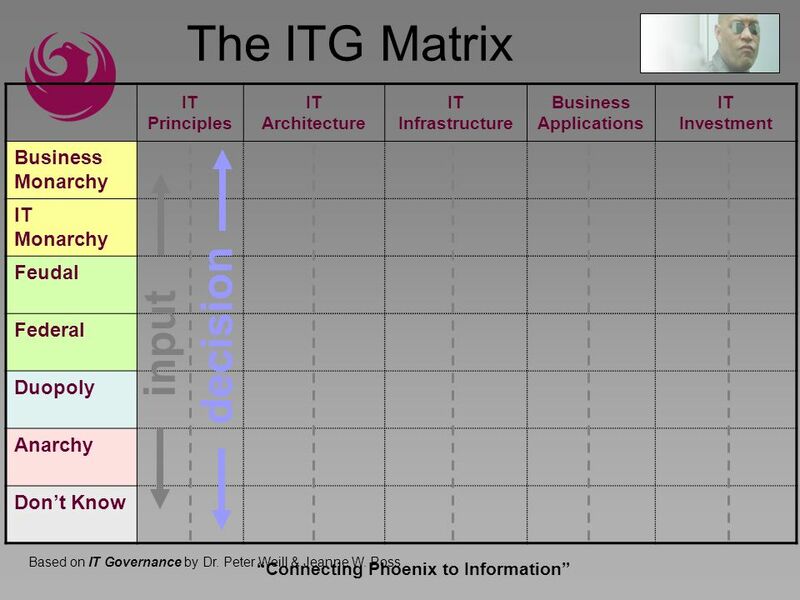 Six Key Assets ITG Model & Decision Rights Take Aways – Take Two! Questions?? 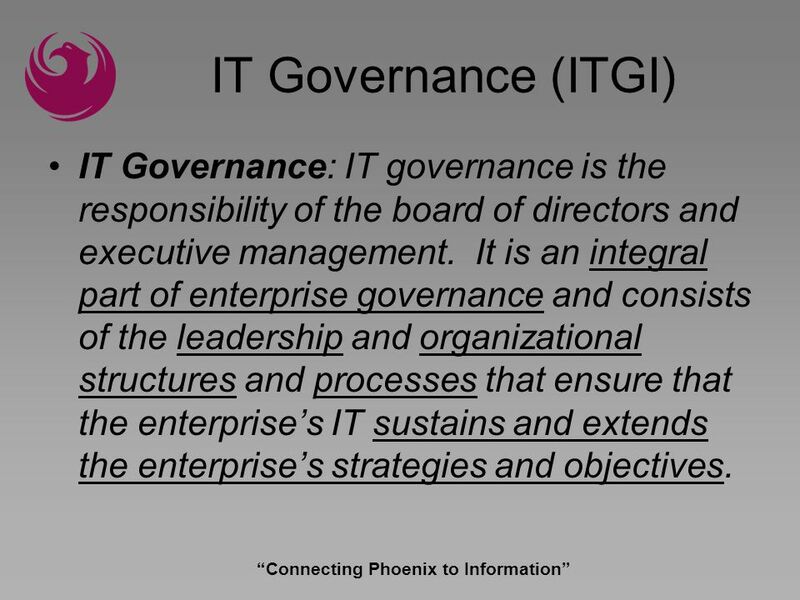 3 Connecting Phoenix to Information IT Governance (ITGI) IT Governance: IT governance is the responsibility of the board of directors and executive management. 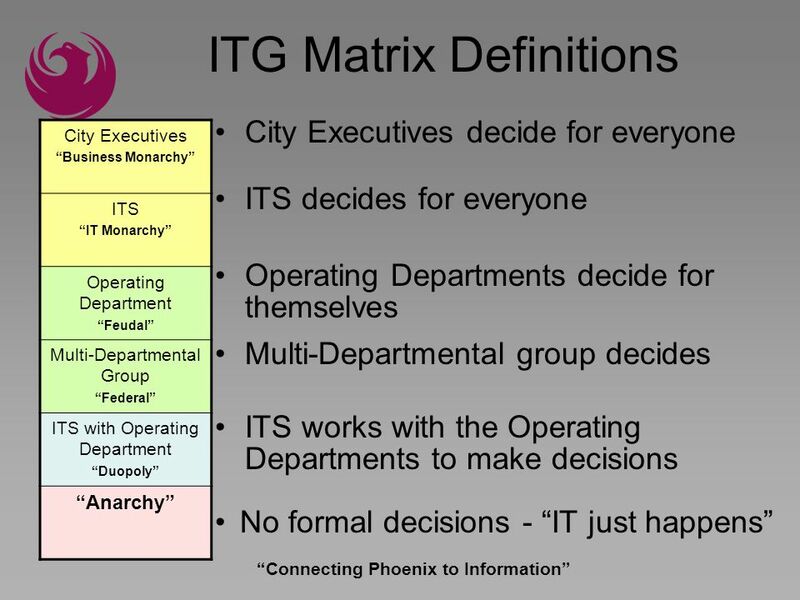 It is an integral part of enterprise governance and consists of the leadership and organizational structures and processes that ensure that the enterprises IT sustains and extends the enterprises strategies and objectives. 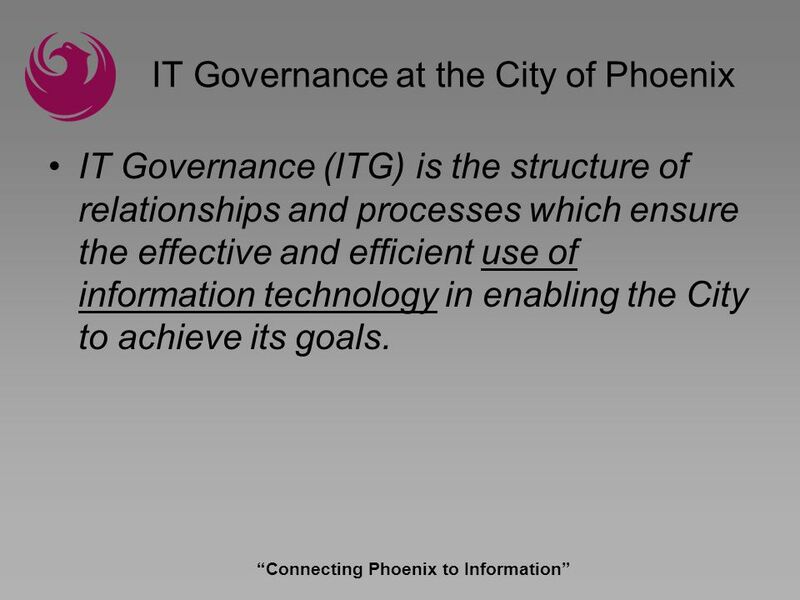 5 Connecting Phoenix to Information IT Governance at the City of Phoenix IT Governance (ITG) is the structure of relationships and processes which ensure the effective and efficient use of information technology in enabling the City to achieve its goals. 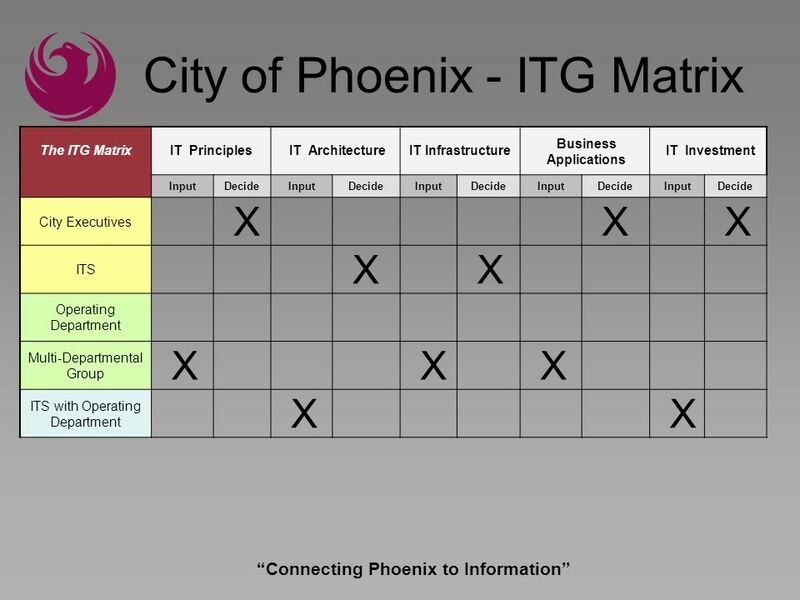 7 Connecting Phoenix to Information Why IT Governance for City of Phoenix? 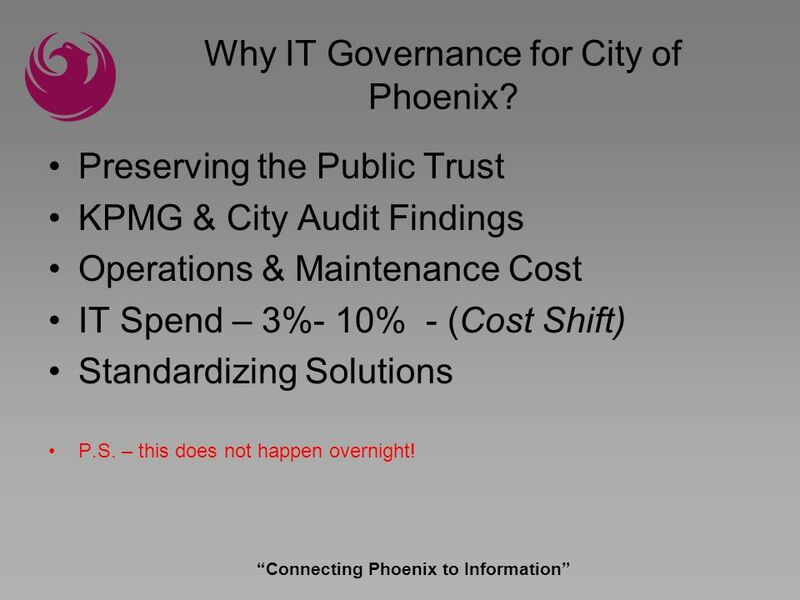 Preserving the Public Trust KPMG & City Audit Findings Operations & Maintenance Cost IT Spend – 3%- 10% - (Cost Shift) Standardizing Solutions P.S. – this does not happen overnight! 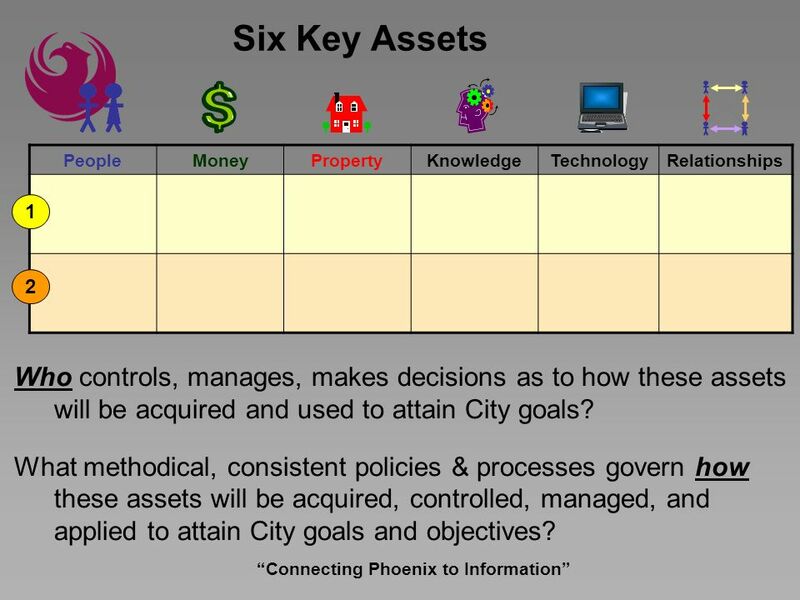 8 Connecting Phoenix to Information PeopleMoneyPropertyKnowledgeTechnologyRelationships Six Key Assets What methodical, consistent policies & processes govern how these assets will be acquired, controlled, managed, and applied to attain City goals and objectives? 1 2 Who controls, manages, makes decisions as to how these assets will be acquired and used to attain City goals? 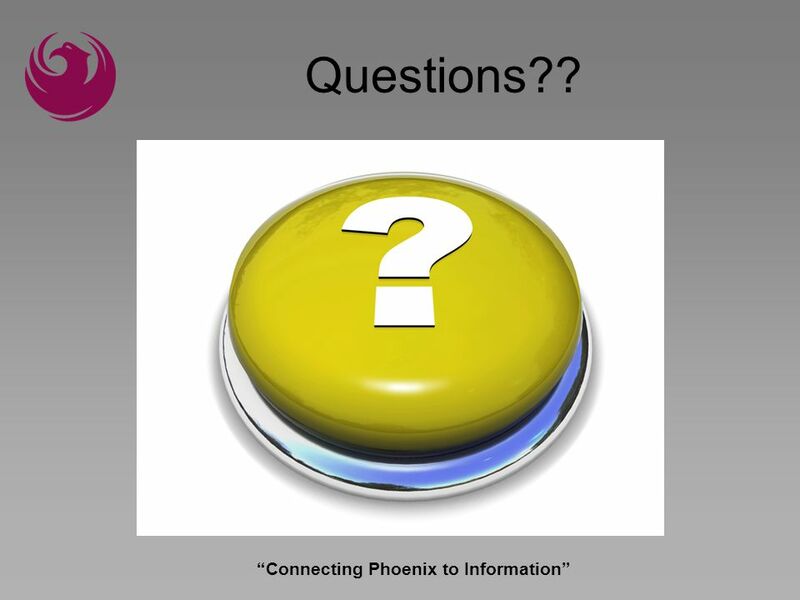 16 Connecting Phoenix to Information Questions?? 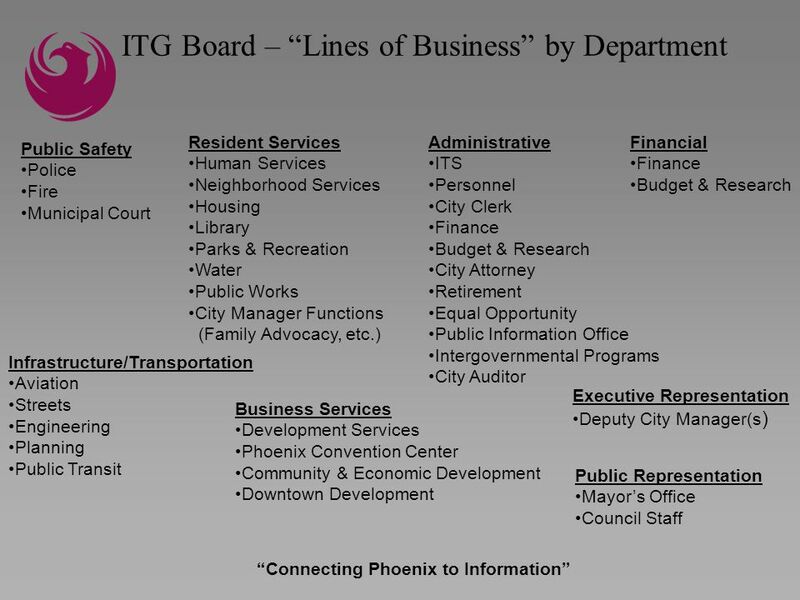 Download ppt "Connecting Phoenix to Information IT Governance in a Decentralized Organization Charles T. Thompson Chief Information Officer City of Phoenix." 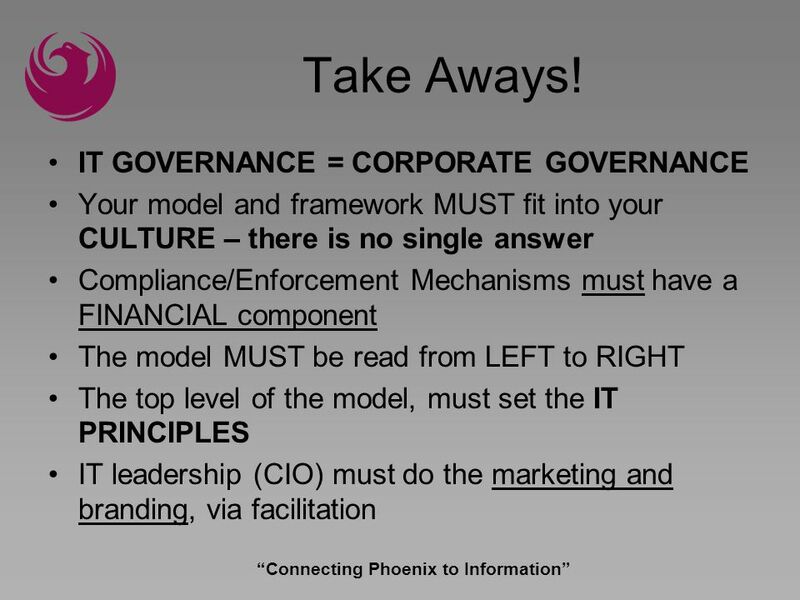 Governance & Enterprise Architecture. Governance & SOA In 2006, lack of working governance mechanisms in mid size to large post-pilot SOA projects will. 17 th Annual New Mexico Infrastructure Finance Conference Integrated Planning and Funding for Utilities Development and Maintenance of the ICIP Program. City of Royal Oak Strategic Planning Session January 22 & 23, 2010 Final Report To The City Commission February 1, 2010. 1 Career Opportunities in Local Government. 2 SERVICE DESIRED SERVICE DELIVERY COUNCIL CAO RESIDENTSRESIDENTS STAFF Relationship Model. 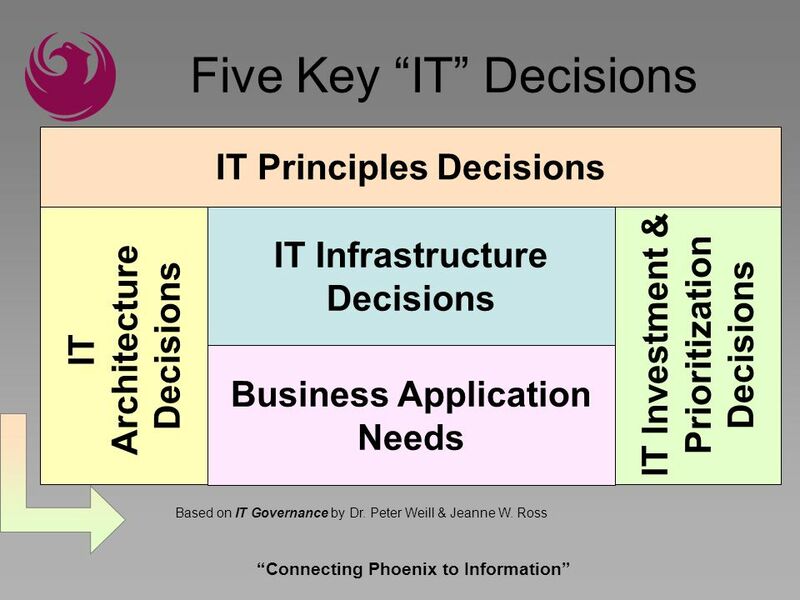 Information Technology Governance What? Why? How? What’s Next? Information Services Committee April 21, 2006. 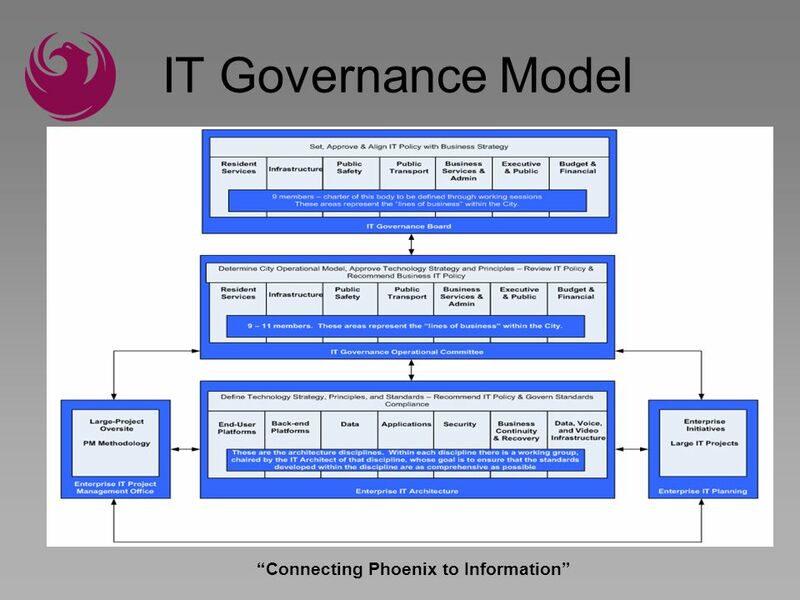 1 IT Governance Presentation to DCO’s Forum 8 June 2005. Madison’s Sustainable Design and Energy Committee: Notes from Portland, Oregon October 3, 2005. 9331 Bluebonnet Boulevard Baton Rouge, LA Louisiana Council of Information Services Directors Maximizing Internal. BNSF Ethics and Compliance Program Roger Nober Executive Vice President Law and Secretary July 13, 2011. Effective Urban Management And Organization: The Melbourne Experience Presented By: Dr. John So, JP 20 th Jan 2009. City Council Offices. Mayor A mayor is an elected person who serves as the head of a city’s government. He or she has many responsibilities and follows. 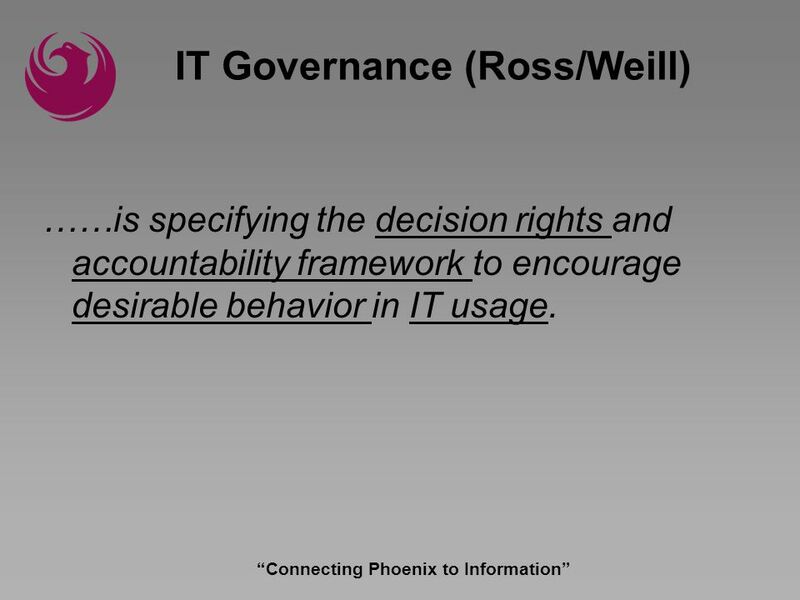 Research Computing Governance Brad Wheeler Office of the VP for IT & CIO © 2007 Trustees of Indiana University Creative Commons Attribution. CITY OF MERIDIAN FY08 BUDGET HEARING Mayor – Tammy de Weerd Council President – Joe Borton Council Vice President – Charlie Rountree Council – Keith Bird. Carnegie Mellon University © Robert T. Monroe Management Information Systems Information Systems Governance Management Information.